Dr. Linda Morrison Combs is a leading expert on what works in running and turning around large organizations with complex budgets and big challenges. 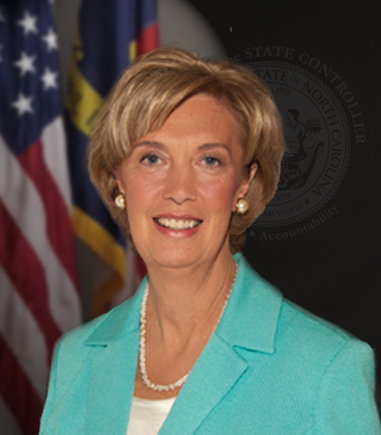 Dr. Combs was unanimously confirmed by the General Assembly as North Carolina’s State Controller in June, 2014. She is the sixth State Controller and the first woman to hold the independent office. This confirmation was to fulfill the office vacated by the previous controller. On April 27, 2016 Dr. Combs was again confirmed unanimously by the North Carolina General Assembly for a term ending in 2022. From 2005-2007 she was Controller of the United States. As Controller, Executive Office of the President, Office of Management and Budget, she worked on the widest possible range of issues at the highest levels of government. She routinely briefed the President of the United States on the status of financial management in the Federal departments, and frequently testified before numerous Congressional oversight committees. She was responsible for establishing financial management policies and requirements for the Executive branch of the Federal government, totaling $2.7 trillion in revenue. Reduced audit completion time (from five months) to 45 days from end of fiscal year for the entire Federal Government – first time in history. Reduced improper payments by $9 billion. Disposed of $4.5 billion of unneeded real property. During her career she has worked for three U.S. Presidents and has earned five Senate confirmations. In previous positions, Combs has been the Chief Financial Officer at the Environmental Protection Agency ($8 billion budget) where she led that agency to obtain a clean audit opinion with no material weaknesses, and received the highest honor awarded—the prestigious Crystal Eagle Award from the President. As Assistant Secretary of the Department of Transportation ($58 billion budget), she led that agency to be the first Federal Department to install a single core financial system Department-wide, resulting in the Department of Transportation being designated a Federal Financial Center of Excellence. Dr. Combs also held Assistant Secretary or equivalent COO roles at the Departments of Treasury, Veterans Affairs, and Education. Not only does Dr. Combs understand government on the inside, she knows first-hand its impact on the private sector. In the private sector Combs’ achievement record is equally significant. She founded three successful companies and took their products to worldwide distribution. She held line management positions with significant profit and loss responsibilities at a large southeastern bank. She holds a doctorate from Virginia Tech, undergraduate and master’s degrees from Appalachian State University, and is a graduate of the Program for Senior Managers at Harvard University. Numerous organizations have honored Combs for her excellence in leadership, exemplary performance and outstanding service. These awards include three from the President of the United States and nine awards from various Members of the President’s Cabinet. Other recognitions include over one hundred and fifty awards, citations, and honors by non-profit, volunteer organizations, higher education institutions and corporations. Dr. Combs was born in Caldwell County and resides in Winston-Salem, North Carolina.